We use quantitative PCR to enumerate pathogens, algae or specific genes involved in the production of undesirable compounds (e.g., geosmin, saxitoxin, microcystin, etc). This approach is rapid, sensitive and specific and enables a quick assessment of potential health risks present in water or shellfish samples. If a QPCR assay indicates a high amount of undesirable taxa, then this information can be leveraged to select which samples are good candidates for further analyses-including toxin testing. 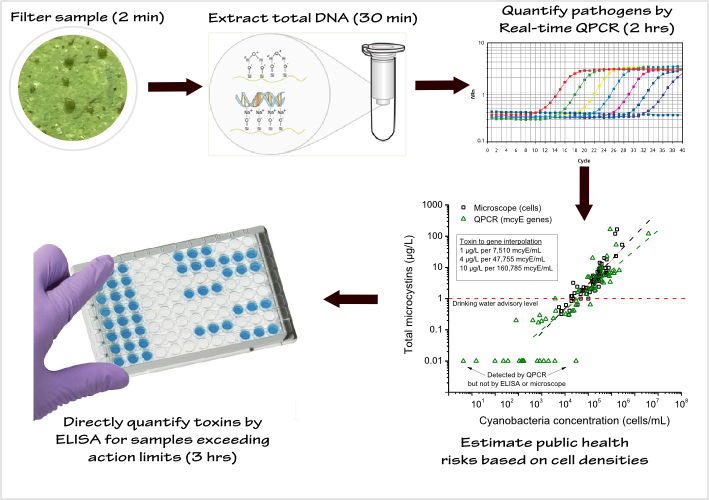 This approach is more cost effective than relying solely upon toxin-based monitoring, and provides an added benefit of producing confirmatory results from two independent analyses. DNA extraction is $20/sample and QPCR assays are $40/sample/assay. Sets of 10 or more samples receive 10% discount.